Having Used the TS 55 EQ for five years now, I was excited when Pro Tool Reviews asked me to test the new TS 55 REQ. I am still more than happy with my TS 55 EQ, so it was interesting to find out how this iconic design could be improved. To give some background, Festool invented the track saw more than 40 years ago. While DeWalt, Makita and Grizzly now offer similar products, Festool is still the benchmark by which track saws are measured. Retrofit rail systems, such as EZ Track, are also available for garden-variety sidewinder saws; however, they are not all that cheap, so I would only resort to this scheme if I owned a compatible saw and had minimal need of a track saw. While DeWalt’s saw is comparably priced to the $585 TS 55 REQ, the others are cheaper. 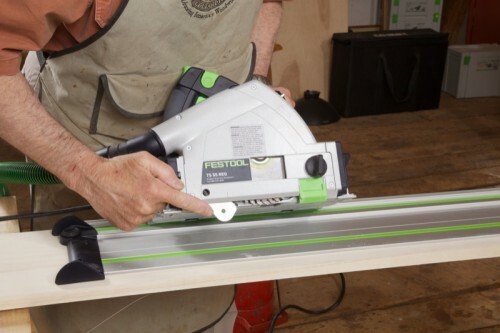 Festool also makes a bigger saw, the TS 75 EQ that fits the same track. While the 55 will cut to a depth of 1-15/16” (50 mm) when mounted on the guide rail, the 75 will handle 2-3/4” (70 mm). A good amount of Internet argument surrounds the question of a TS 55 replacing a table saw. It will, but it will never make some cuts as fat as a well set up table saw can. To really achieve table saw functionally, Festool envisions you also owning their Multi Function Table/3 (MFT/3), which costs $625. The MFT is a very solid portable workbench that has a miter gauge rail combination to facilitate 90°, angled or compound crosscuts. A friend who runs a custom cabinet operation in Asheville, North Carolina is using three MFT/3 tables in the shop for breaking down sheet goods. The track saw will also replace an edge jointer, for it leaves square, straight, glue-ready cuts. The Parallel Guide Extension Set allows serial ripping of sheet goods and along with the MFT/3 is necessary to make the TS 55 REQ truly replace a table saw. There are two short and two long bars in the set. A short bar is attached to a long bar to form left and right pairs. The pairs can remain together for life. The long bar allows exact parallel ripping of widths between 7-7/8” (190mm) and 25-15/16″ (650mm). The stop on each bar is set to the desired width of the rip in millimeters and placed against a trued edge. The rail is now clamped to the workpiece, and the saw does its magic again, again and again with unvarying accuracy. For ripping widths from zero to 9” (230 mm) the rail and attached bars are reversed. The stops need to be reversed as well. The scales on both the short and long bars need to be calibrated on the first use and checked periodically. For the short bar the 2.2 mm width of the blade must be allowed for. Once adjusted, the Parallel Guide Set works as advertised and makes quick work of serial ripping set widths. The plastic splinter guard on the track itself prevents splintering on the left side of a cut, and the plastic splinter guard on the right side of the saw prevents it on the right side of the cut. The splinter guards, be they on the rail or the saw, are consumables and need occasional replacement. The TS 55 REQ comes with both a plastic viewing window and a splinter guard. Splinter guard replacements come in a pack of five. I only use the viewing window when the knob that holds the splinter guard on the right side of the saw prevents working close to an edge.